One undeniable benefit of association membership is the opportunity for members to obtain continuing education at free or reduced cost. 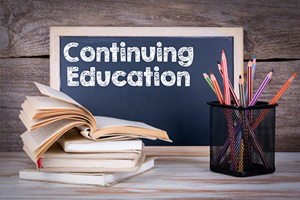 Particularly in the medical profession, continuing education is a non-negotiable requirement for many professionals to remain licensed in their fields. Live conferences in various formats, including symposia, practicum, lectures, and roundtable discussion. Virtual, live opportunities. Webinars are perhaps the most accessible and popular CE activity format. Participants can earn CE from the comfort of their homes or offices by attending a live webinar online. They are given the opportunity to ask questions of the speaker to ensure a truly interactive experience. Enduring materials, which are non-live CE activities that endure over time. Popular formats of enduring materials include podcasts, satellite broadcasts, monographs, and DVDs. Enduring materials allow the learning experience to take place at the convenience of the participant. Agentis staff members are prepared to oversee all continuing education requirements of their clients. They ensure that all conditions are met for each activity, while writing grant applications and securing sponsorships for funding when needed. Following each activity, certification materials are sent to all participants and current records of all activities are securely kept on file, meeting all obligations to the CE provider. We understand the significance of these activities to our professional members, and work to ensure that each continuing education application and activity will be seamless from start to finish.